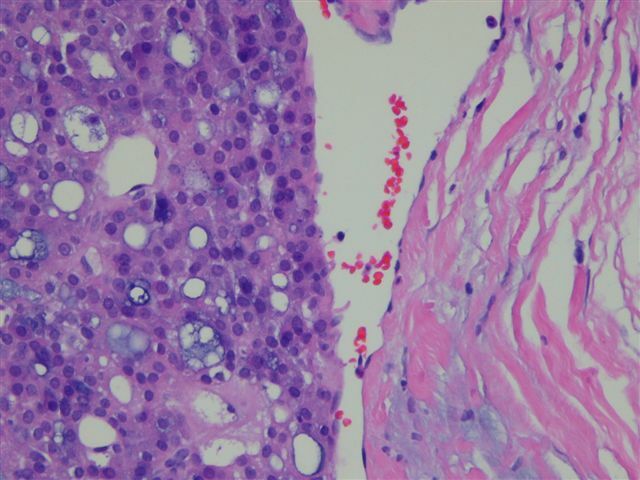 Please visit our Books page, where we recently added 10 new books.� We list all books of interest to pathologists, sorted by 48 subject categories (such as cytopathology, GI, GU, hematopathology, etc.) 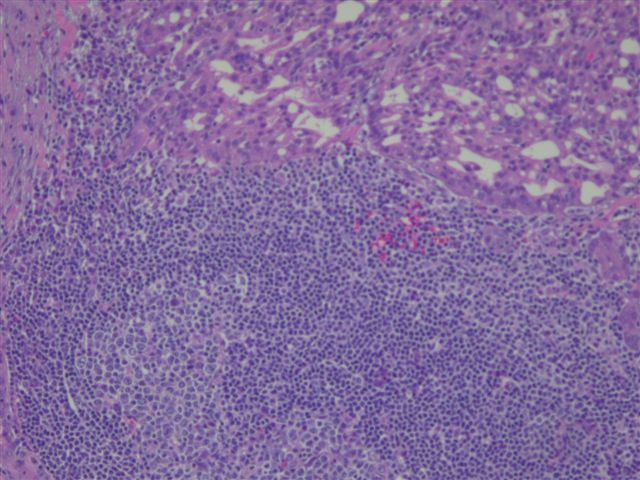 and by author.� There are also separate categories of New books, AFIP books and WHO tumor books.� We have also posted a new Email update (from the Home Page, click on the Email Updates button on the left hand side) detailing recent changes made to PathologyOutlines.com. 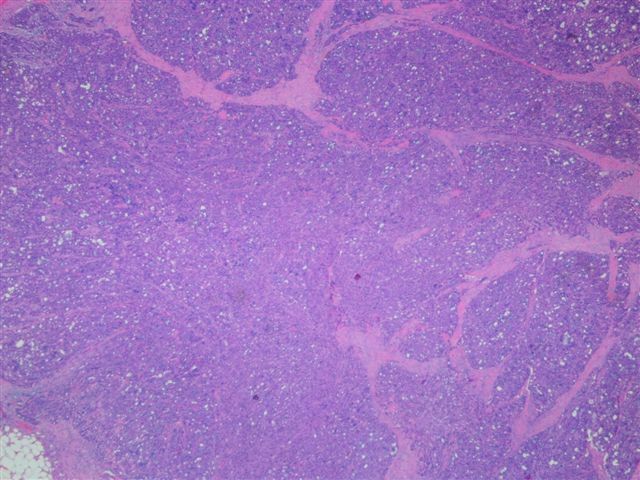 The patient is a 63 year old man who presented with a slowly enlarging, somewhat painful mass of the cheek.� A� 6.0 x 4.5 x 3.0 cm portion of soft tissue was received fresh for frozen section, which demonstrated a 2.4 x 1.0 x 0.4 cm well circumscribed bright yellow to dark brown and hemorrhagic mass. 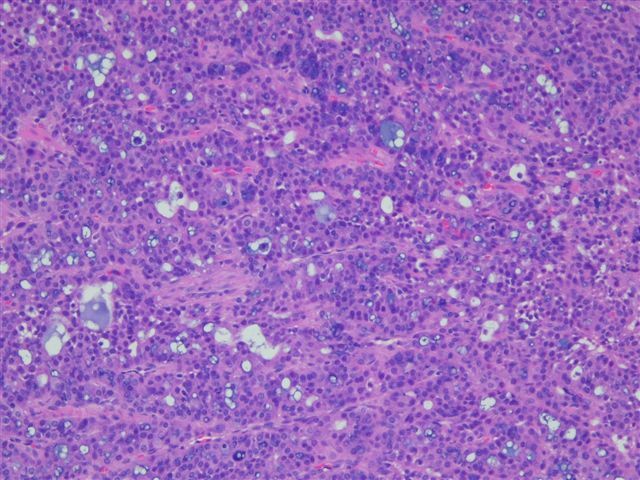 Grossly, acinic cell carcinomas are often encapsulated, tan-gray, and usually 3 cm or less.� Up to 3% are bilateral or multicentric.� There is usually a mixture of patterns, including solid, microcystic, papillary-cystic and follicular.� However, the lobular pattern of the normal parotid gland is absent.� At least a portion of the tumor demonstrates serous type acinar differentiation with large polygonal cells containing granular, PAS+ basophilic cytoplasm due to zymogen granules.� The nuclei are eccentric, dark and round.� There may also be clear cells containing glycogen, vacuolated cells, glandular cells and intercalated duct type cells.� Lymphoid stroma may be present (Hum Pathol 1997;28:595), as in this case (image4).� Psammoma bodies are occasionally found.� The striated ducts of the normal parotid gland are lacking. 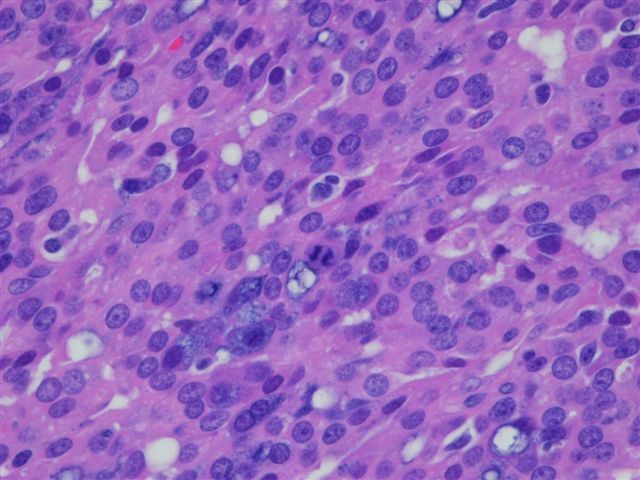 These tumors may have amylase positive cytoplasm, although immunohistochemistry is typically not helpful in diagnosis.� Electron microscopy may demonstrate relatively specific, zymogen like cytoplasmic granules that are electron-dense, round-oval and membrane bound.� The acinar tumor cells also have a well-developed rough endoplasmic reticulum similar to normal salivary glands (see figure 5; zymogen granules-pancreas). 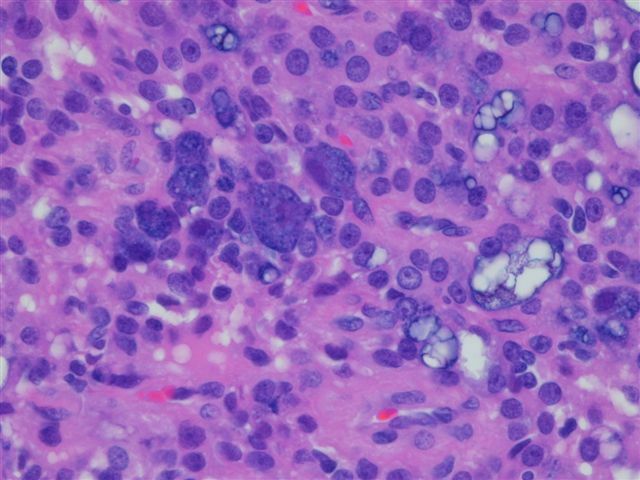 The differential diagnosis may include normal parotid gland, which has a lobular architecture with striated and interlobular ducts, as well as acinar cells.� The follicular and papillary patterns may resemble thyroid carcinoma and the papillary pattern may resemble low grade salivary duct carcinoma (Am J Surg Pathol 2004;28:1040).� Fine needle aspirations must be interpreted with caution, as they are often diagnosed as benign or non-neoplastic (Curr Opin Otolaryngol Head Neck Surg 2006;14:62). 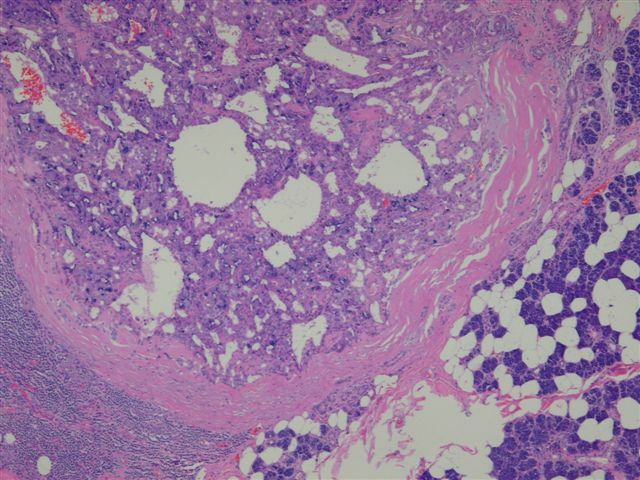 pleomorphism (image5), increased mitotic activity (image6), vascular invasion (image7) and clinical pain or fixation.� Other poor prognostic factors are high stage, positive margins, tumor necrosis, stromal hyalinization, perineural invasion, large size and involvement of the deep lobe of the parotid gland. Approximately 10-15% of acinic cell carcinomas metastasize, usually to local lymph nodes.� Adequate excision is important, as it reduces the recurrence rate from 80-90% (with inadequate excision) to 10-30%.� The surgeon can usually spare the facial nerve (Ear Nose Throat J 2005;84:597).� Radiation therapy may be useful for positive surgical margins, advanced stage or high grade histology.� Overall 5 year survival is 90%, the highest among parotid gland malignancies (Am J Otolaryngol 2005;26:39), but late deaths also occur.